Mega-huge balls + parachutes = wacky fun for the whole family. Pop, pop, you just can’t stop! 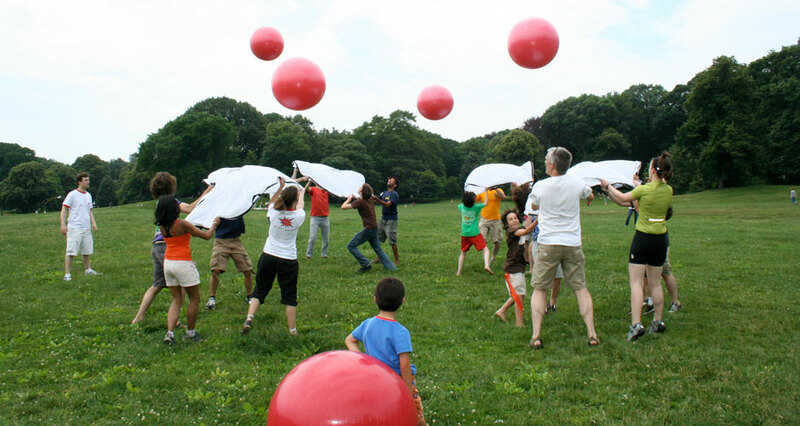 Ball Pop is a series of original games and challenges that we’ll play with parachutes and massive inflatable balls. Some will involve teamwork and collaboration, others will be competitive, and we’ll end with an amazing daredevil challenge. The games — Ball-y-Oop, Juggalot, Ball-der-Dash, and Para-Shoot — get crazier and crazier as we go along. This is the perfect activity for everyone: children and adults, friends and neighbors, parachutists and beach bums. We’ll have a ton of fun, so we hope you join us! ESI Design is a New York based experience design firm that inspires action through engagement. Founded in 1977 by interactive pioneer Edwin Schlossberg, ESI specializes in creating physical spaces, storytelling platforms, collaboration tools and engagement programs for leading corporations and cultural institutions including Ellis Island, AT&T, PNC, and Reuters.